A two-player redemption game from ICE. Whirl Win creates an exciting arena where reflexes and hand-eye co-ordination are tested. 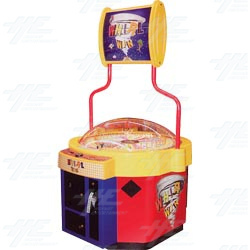 Players must attempt to stop the spinning light in a bonus area to win the big ticket payout. Narrowly missing out on the main bonus area can still win lower ticket values, depending on the level of skill and accuracy. A two-player redemption game from ICE. Whirl Win creates an exciting arena where reflexes and hand-eye co-ordination are tested. Players must attempt to stop the spinning light in a bonus area to win the big ticket payout. Narrowly missing out on the main bonus area can still win lower ticket values, depending on the level of skill and accuracy.